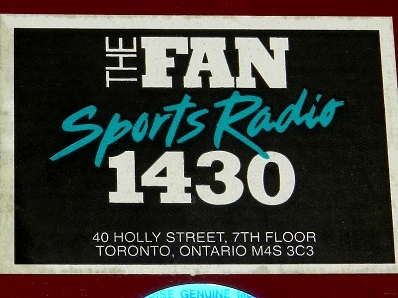 TORONTO (Sep. 4) — The names have changed with ownership and the unquestioned priority of television over radio — from CJCL AM–1430 to The Fan–1430; The FAN–590; Sportsnet Radio The FAN–590 and, today, Sportsnet–590 The FAN. 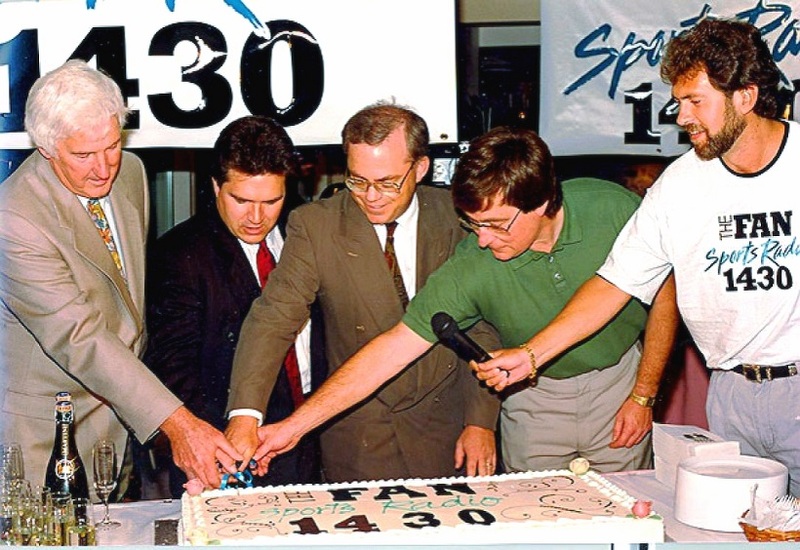 What will never change is that Canada’s first all–sports radio station launched 25 years ago this afternoon: Sep. 4, 1992. In the main lobby of the SkyDome Hotel (today, the Renaissance Toronto Downtown) — with those legendary rooms that overlook the field for Toronto Blue Jays games. The sports–radio trend in our land has flowered rather spectacularly over a quarter–century. By my count, there are nine–such entities broadcasting in English, with a 10th, coincidentally, starting up today. Along with Sportsnet–590 here in Toronto, there is TSN–1060 (Montreal); TSN–1200 (Ottawa); TSN–1050 (Toronto); TSN–1110 (Hamilton); TSN–1290 (Winnipeg); Sportsnet–960 (Calgary); TSN–1260 (Edmonton) and TSN–1040 (Vancouver). 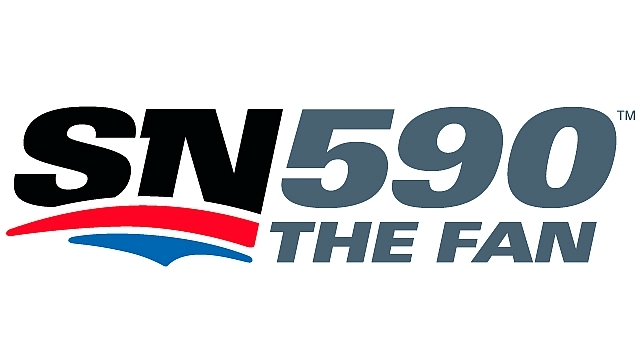 The latter station gets direct competition, starting today, with the launch of Sportsnet–650, also in Vancouver. TSN stations are owned by Bell Canada Enterprises; Sportsnet by Rogers Communications. I joined the radio station founded by Foster Hewitt (and originally containing his initials: CKFH) on May 30, 1988 as a $270–a–week gopher. My boss, Doug Ackhurst, encouraged me to come into the office “just for a few hours, here and there” — apparently contrite over my “salary”. Of course, I had other intentions. No one displays energy, determination and work–ethic by appearing “for a few hours, here and there”. Or, at the beginning, by moving slowly when the Program Director wants a coffee. 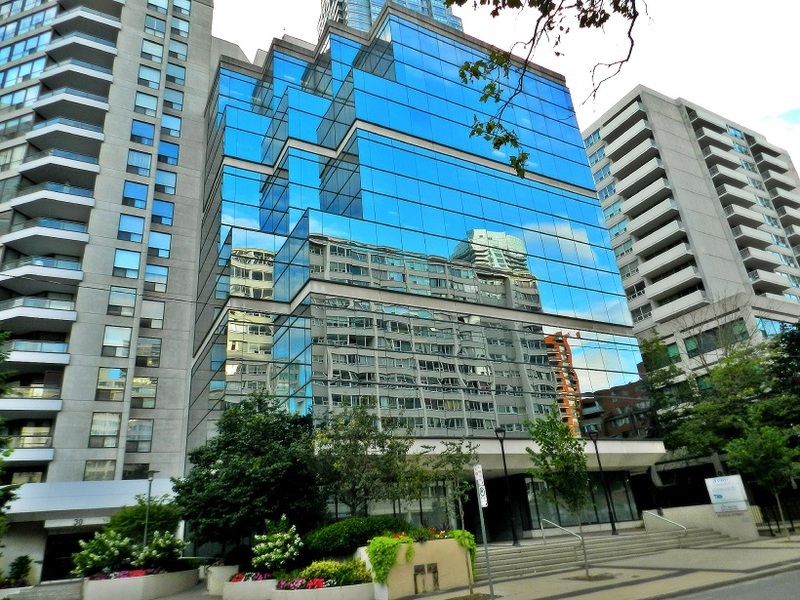 So, I did everything but sleep in our beautiful building at 40 Holly St. in the Yonge/Eglinton district of midtown Toronto (where I currently reside). On this day, 25 years ago, the holdovers from CJCL AM–1430 gathered in the SkyDome Hotel lobby. The change to an untried, yet promising format was primarily dictated by demographics. Our outgoing arrangement — known as The Music of Your Life — was very popular and garnered huge listener–ship; we played songs from the 1950’s and 60’s. Those tuning in were prone to spend money… on walkers and bed–pans rather than houses and automobiles. So, we needed to get “younger”. 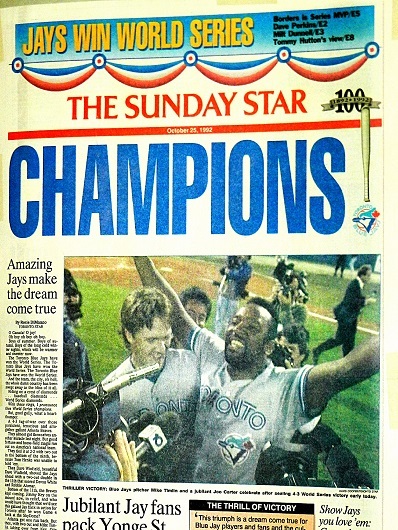 The Blue Jays were all–the–rage in our city, and across most of the nation, after teasing their fans by making the playoffs in 1985, 1989 and 1991; losing each time in the American League Championship Series. A fourth–such appearance was inevitable after Toronto general manager Pat Gillick had stunned the baseball world by acquiring elite starter David Cone from the New York Mets the previous week. Momentum appeared to be on our side. A KEY–CHAIN I’VE KEPT THROUGH THE DECADES WITH OUR PRE–ALL–SPORTS–RADIO LOGO. Unbeknownst to all, the Toronto Maple Leafs (having missed the playoffs in consecutive springs) were set to embark on the best season of the post–1967 era. Eight months earlier, GM Cliff Fletcher had acquired Doug Gilmour in the largest–volume trade (10 players) of all time in the National Hockey League. And, just more than three months before the launch of our sports format, Pat Burns had come from Montreal as head coach. Though slogging through a dreadful 1992 season, the Canadian Football League Toronto Argonauts were defending Grey Cup champion. And exactly 14 months would pass until the National Basketball Association (on Nov. 4, 1993) awarded Toronto a franchise; the Raptors to begin play in the 1995–96 season. It appeared — and I stress, appeared — to be the perfect time for an historic leap in radio formatting. Bob McCown, then 40, hosted our afternoon gala from a remote–broadcast set–up in the SkyDome Hotel lobby; the affixed stadium having opened three years and three months earlier. It was news–reader Natalie Pujo (later a news–anchor at CITY–TV here in town) that threw to McCown just after 1 p.m. to inaugurate the format switch. 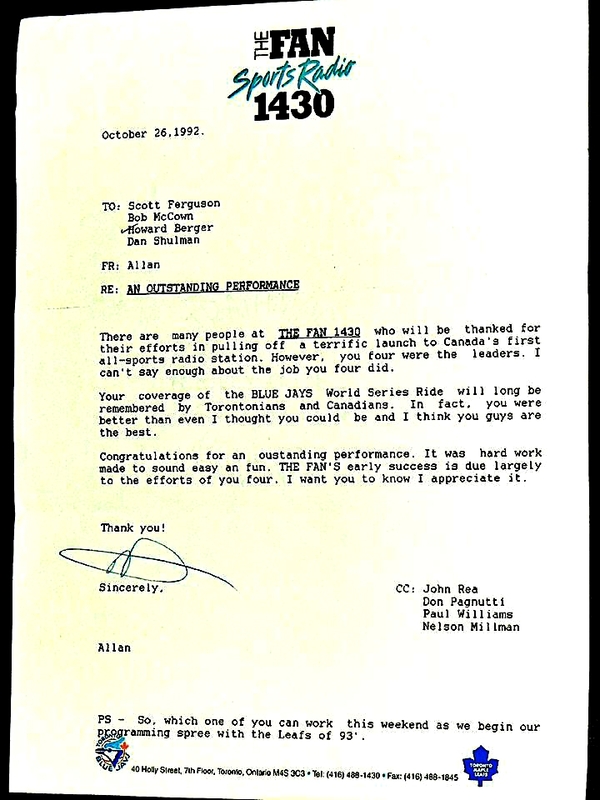 Invited for the occasion were top executives from Toronto’s professional sports teams: Fletcher of the Leafs; Paul Beeston of the Blue Jays and GM Mike McCarthy of the Argonauts. They joined our general manager, John Rea, to make the ceremonial first slice in an enormous birthday cake with The Fan–1430’s new logo adorning the top. My role on that day was more of a by–stander and observer. 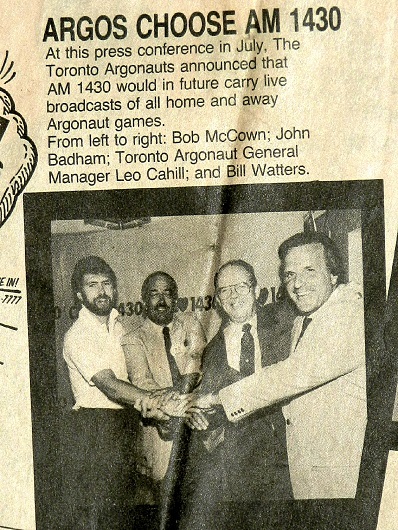 I remember being next to the old Argonauts coach, Leo Cahill, who had occasionally co–hosted Talking of Sports (an evening call–in show) with McCown. As guest–after–guest paraded to the microphone, Leo was forlorn. “Twenty years ago, I would have been up there all day,” he lamented, recalling his wildly–popular term (1967–71) as face of the CFL franchise. “Now I’m back here, sitting with you.” Thanks a bunch, Leo. 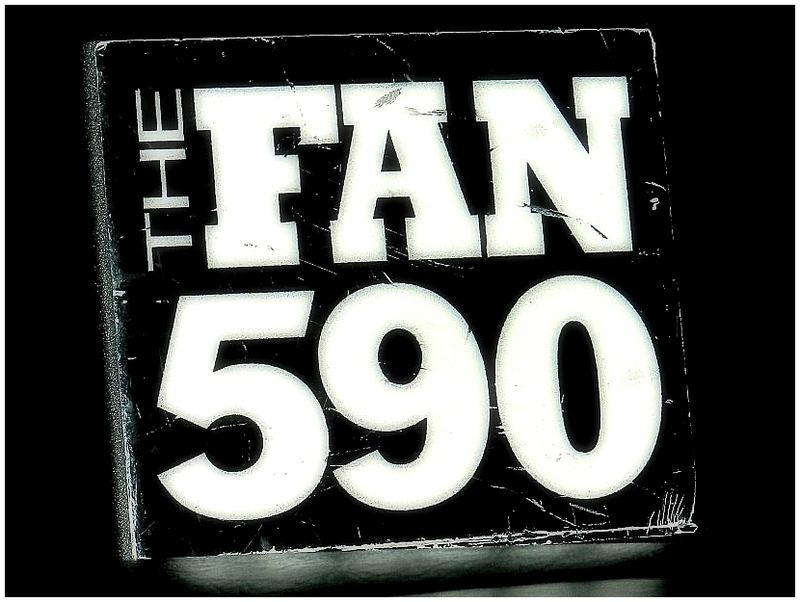 The Fan–1430’s first line–up debuted the following Tuesday (Sep. 8). Monday had been Labor Day. Our morning show (5:30–10 a.m.) was co–hosted by Mike Inglis and Joe Bowen, with the ever–popular Halina Balka providing traffic updates. 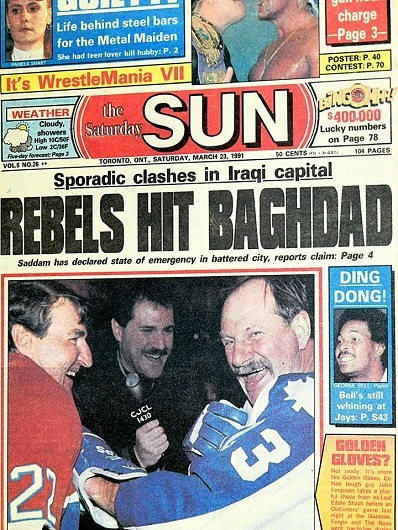 Inglis, a Toronto native, had been radio voice of the CFL’s Winnipeg Blue Bombers in the mid–to–late–1980’s. He later became the first radio play–caller of the Toronto Raptors and is currently voice of the Miami Heat, a position he’s held since 1998. Bowen needs no introduction around here. Only Foster Hewitt, the inventor of hockey broadcasting, called Toronto Maple Leafs games longer than Joe, who started in 1982–83. Bowen had done morning sportscasts in the Music of Your Life format. Our mid–morning show (10 a.m.–12 noon) was co–hosted by Steve Simmons of the Toronto Sun and Mary Ormsby of the Toronto Star. 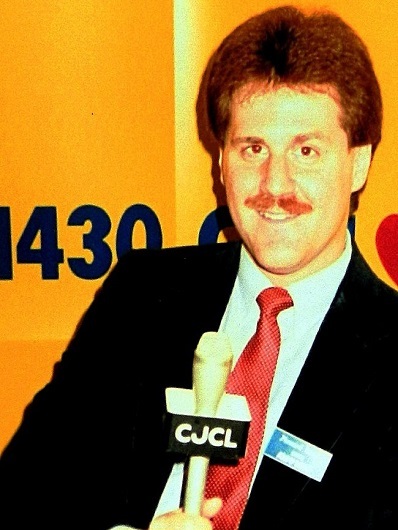 Steve has been a sports columnist at the Sun since 1987 and is today prominent on TSN–1050 Radio here in town. Ormsby, a sports and news writer at the Star since the early–80’s, is married to my old Leafs traveling partner, Paul Hunter, who covered hockey for the Star in the 90’s and first decade of the new millennium. Today, Paul is a feature writer at Canada’s largest newspaper. The mid–day show (Noon–3 p.m.) belonged to Dan Shulman — in the infant stage of his wondrous broadcasting career. Today, of course, Dan is recognized among the premier baseball and basketball voices in North America, working primarily for ESPN while handling roughly 35 Blue Jays games on Sportsnet with Buck Martinez and Pat Tabler. Bob McCown moved in solo from 3–5 p.m. and was joined by the late Jim (Shaky) Hunt for Prime Time Sports (5–7 p.m.). 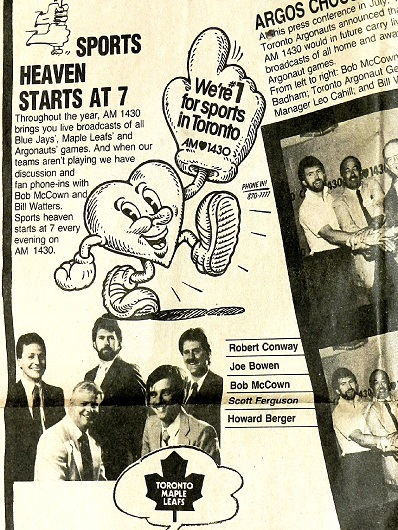 Mike Hogan handled evenings (7 p.m.–midnight) when we didn’t have a Blue Jays or Leafs game on the air. 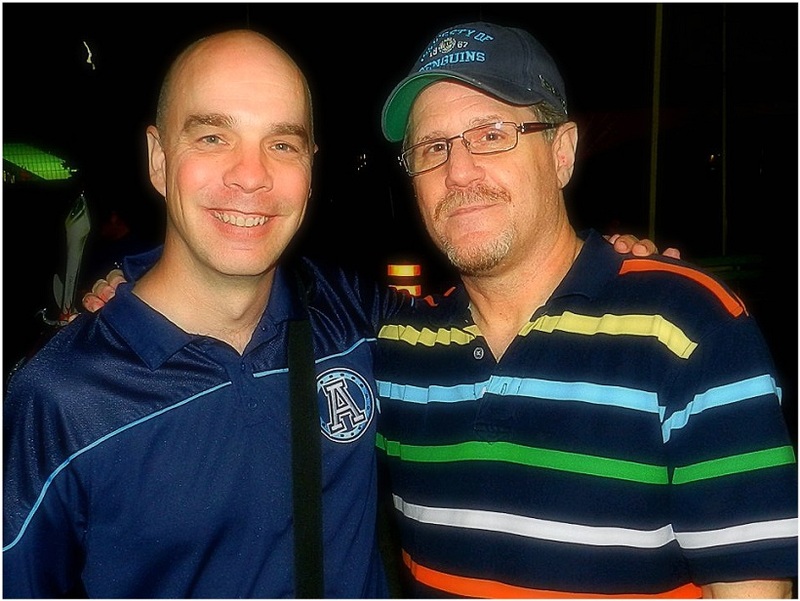 Today, Mike works for TSN–1050 and has long–been radio voice of the Toronto Argonauts. Our final piece was the nocturnal one — Stormin’ Norman Rumack — who yelled at and argued with callers from midnight to 5 a.m., cultivating his role as the “late night vampire”. Norm also co–hosted in the evenings and on weekends with Belleville, Ont. native Jim Richards, who today hosts the Jim Richards Showgram (noon–4 p.m.) on Toronto’s Newstalk–1010 (CFRB). Morning sportscasts (at the top of each hour) were handled by Ken Daniels, today the long–time TV voice of the Detroit Red Wings. 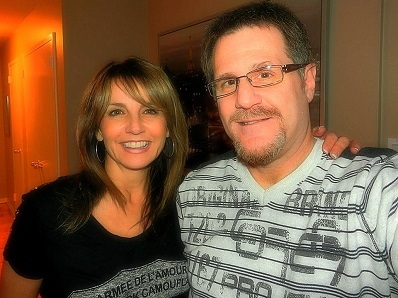 Barb DiGiulio took over for Ken during mid–day hours and is currently the evening host (7–10 p.m.) on Newstalk–1010. She is also my closest radio friend; we worked together for 23 years. Scott Ferguson moved in for Barb and handled afternoon–drive sportscasts. 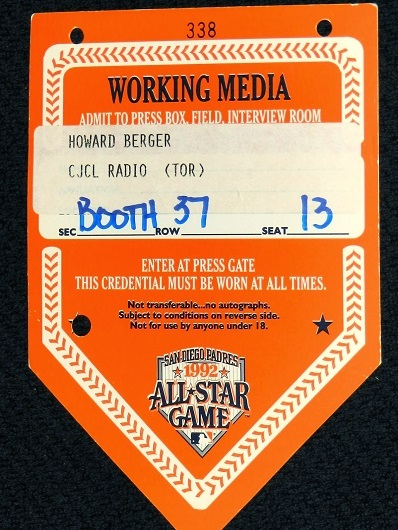 Fergy was also host of the Blue Jays pre and post–game shows, currently the domain of Mike Wilner. Today, Scott works for TSN–1050. OUR BEAUTIFUL RADIO HOME IN THE FIRST DECADE OF THE ALL–SPORTS FORMAT AT 40 HOLLY ST. IN MIDTOWN TORONTO (AS IT APPEARED LATE SUNDAY AFTERNOON). 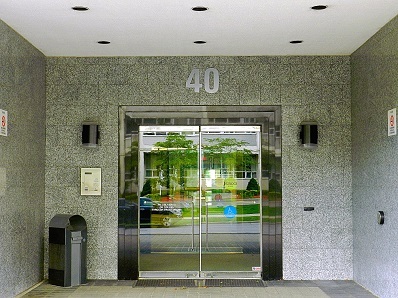 WE OCCUPIED THE SEVENTH FLOOR OF THE 15–STORY BUILDING. I WISH I HAD A DOLLAR FOR EVERY TIME I WALKED THROUGH THE FRONT ENTRANCE (BOTTOM–LEFT) AND RODE THE ELEVATORS BETWEEN 1988 AND 2002. DURING THOSE YEARS, WE WERE OWNED BY TELEMEDIA INC. OF MONTREAL. 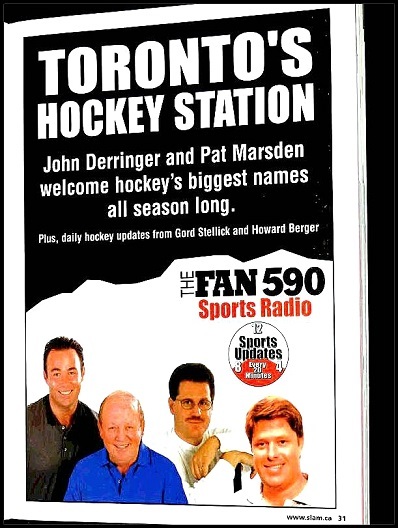 TELEMEDIA SOLD THE FAN–590 TO ROGERS COMMUNICATIONS IN EARLY–2002. WE MOVED, THAT SUMMER, FROM HOLLY ST. TO THE ROGERS BUILDING AT THE JARVIS AND BLOOR ST. INTERSECTION OF DOWNTOWN TORONTO. We had quite the honeymoon period during the first two years of the all–sports format. The Blue Jays won consecutive World Series titles and the Leafs, led spectacularly by Gilmour, went to the Stanley Cup semifinals in consecutive springs. Then, baseball and hockey shut down for a period of time owing to labor disputes and the still–young format nearly died. Major League players went on strike in mid–August 1994 and owners eventually canceled the playoffs and World Series. To suggest it rankled our baseball advertisers is rather an understatement. When Gary Bettman locked out NHL players between October 1994 and January 1995, our hockey sponsors raged. Only the dogged persistence of our ownership (losing hundreds–of–thousands in ad revenue), and its long–term belief in the format, precluded a switch back to music. My role at the radio station began as a roving reporter. I would schlep our microphone–flash around the city and do periodic live hits during the day. 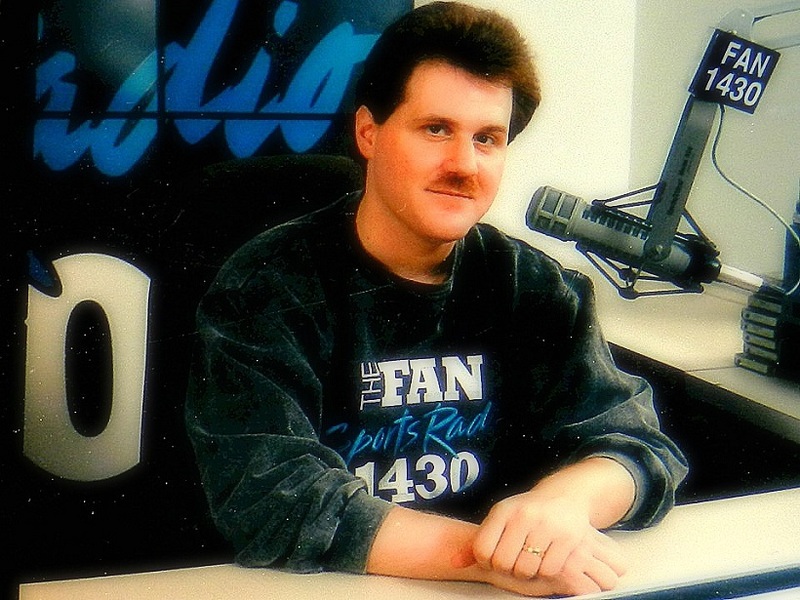 In 1988 and 1989, I handled top–of–the–hour sportscasts on weekends (8 a.m.–1 p.m.), working with a roving cast of news–readers (among them, Barb DiGiulio, Natalie Pujo, Donna Desrochers, John Northcott, Bob Comsick, Stephanie Smyth, Brent Coppin, Chris Wilson and news director Scott Metcalfe). 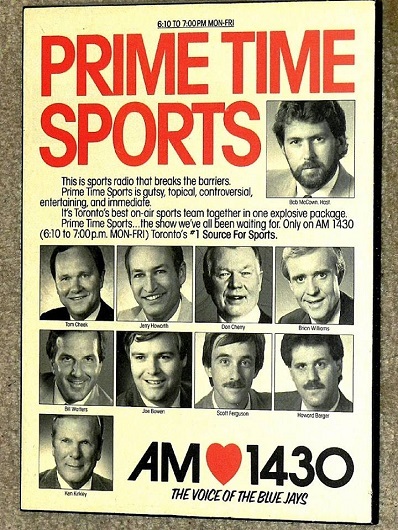 I was the original producer of Prime Time Sports (with McCown and Bill Watters) when it debuted Oct. 2, 1989, continuing in the role until 1993 (when succeeded by Chris Clarke). 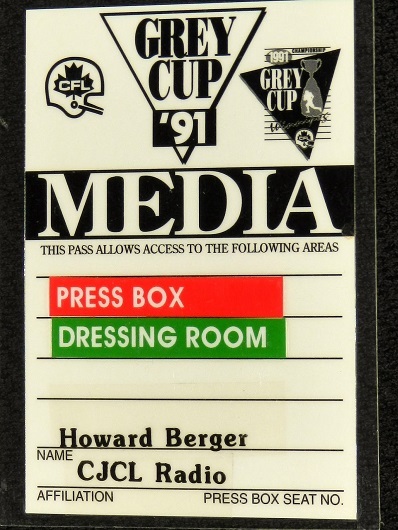 During that time, I also covered the Leafs, Blue Jays and Argos at home (and on the road during the playoffs). 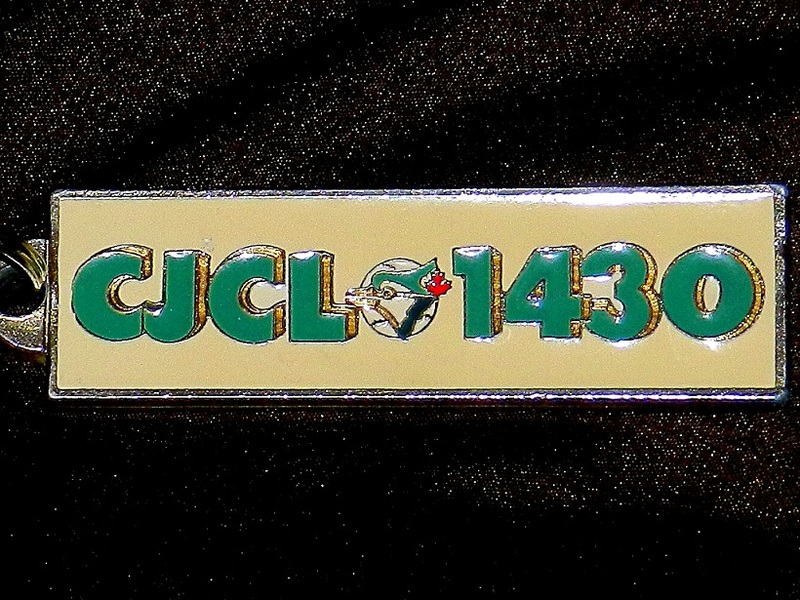 I BEGAN WORKING AT CJCL AM–1430 ON MONDAY, MAY 30, 1988. 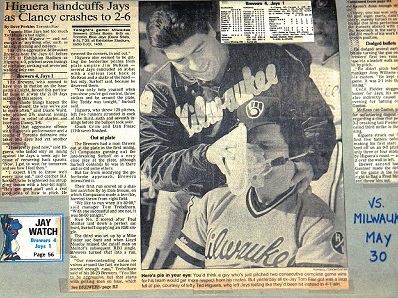 THAT NIGHT, I COVERED THE MILWAUKEE–BLUE JAYS GAME (FROM MY SCRAPBOOK, ABOVE) AT OLD EXHIBITION STADIUM. 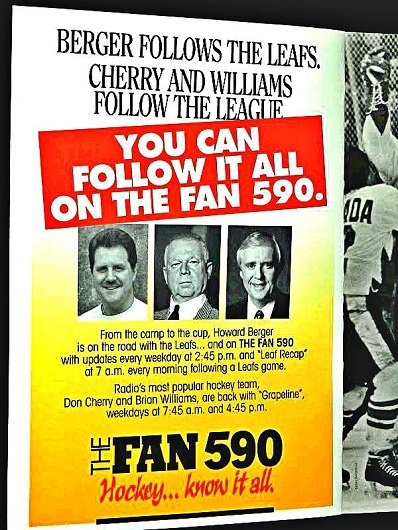 My big break, if you will, at The FAN–590 (we moved down the dial from the AM–1430 frequency on Feb. 6, 1995) occurred after the NHL owners and players settled their differences. 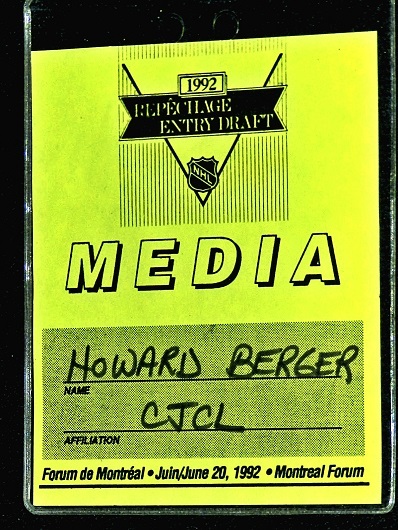 Never before, or since, have I gone without sleep for nearly 38 hours, as I did on Jan. 9–10, 1995 while in New York covering the last–ditch negotiations between Bettman and NHL Players Association boss Bob Goodenow. A 48–game regular season was salvaged when the sides settled on a new Collective Bargaining Agreement. The Leafs would open the abbreviated schedule with a trip to Los Angeles and San Jose, Jan. 20–21. 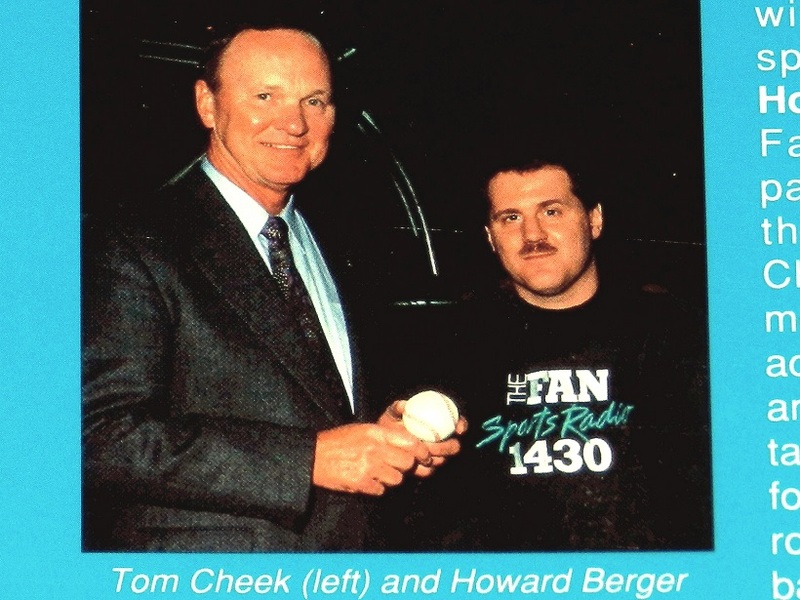 I had, by then, written a couple of books for Warwick Publishing Inc. — ghosting an autobiography of the Blue Jays original radio voice, Tom Cheek, and penning a 30–year reflection (1964–1994) of the Maple Leafs. While still in New York, an idea popped into my head. I called Jim Williamson at Warwick and suggested I follow the Leafs through their entire 48–game season (and playoffs) for a diary–type book. Jim quickly ok’d the project and the radio station had no issue with its now–senior reporter traveling with the hockey club on Warwick’s ticket. Even more of a break, selfishly, occurred in July 1995. While visiting my in–laws in Los Angeles, I received a telephone call from news and sports director, Scott Metcalfe, who informed me the Leaf broadcast rights had been usurped by Corus Entertainment (now Talk Radio AM–640). He had a message from Telemedia GM Doug Ackhurst: “Next season, you’ll continue to follow the Leafs and we’ll pay for your travel.” It was a rather exhilarating moment. 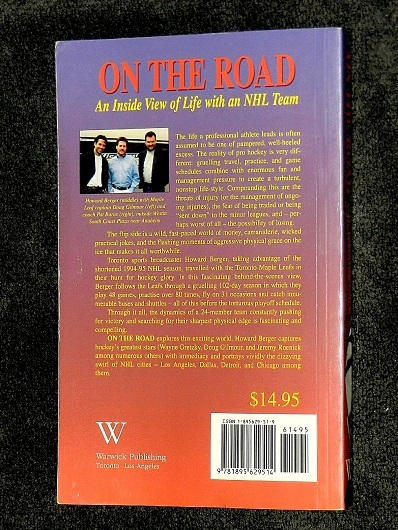 And, it continued for another 14 NHL seasons; we having invented a new role — radio beat–reporter for a hockey team. 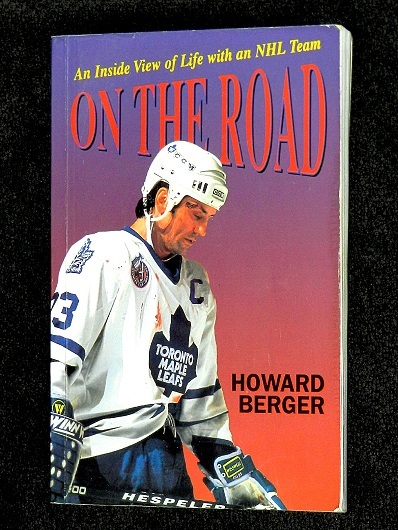 I was privileged to cover the Leafs, home and away, from 1995 to 2009. During that time, I also attended the Stanley Cup final; NHL All–Star Game and the NHL draft. Included were long, rewarding assignments to the 1996 Summer Olympics (Atlanta), and Winter Olympic Games involving NHL players: 1998 (Nagano, Japan); 2002 (Salt Lake City); 2006 (Turin, Italy); 2010 (Vancouver). My time at the radio station ended on June 1, 2011. I have only the fondest of memories. 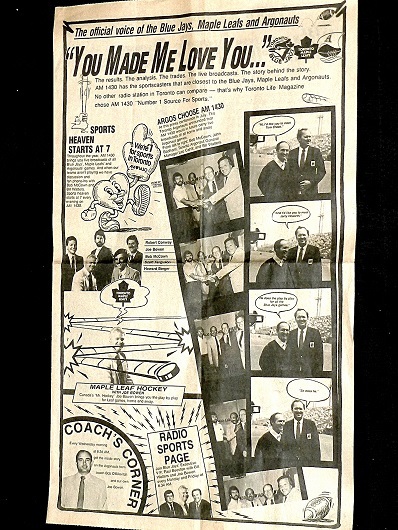 THIS NEWSPAPER AD APPEARED IN MID–SEPTEMBER 1988 — 3½ MONTHS AFTER I BEGAN WORKING AS A REPORTER/GOPHER AT CJCL AM–1430. 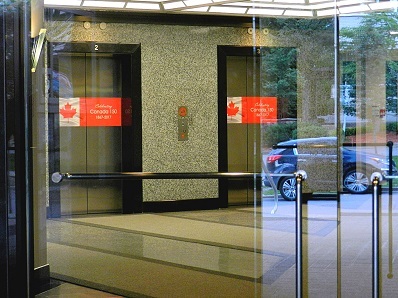 WE HAD AN OPEN HOUSE AT 40 HOLLY ST. ON A SATURDAY, THE MORNING AFTER CANADIAN SPRINTER BEN JOHNSON HAD APPARENTLY WON THE 100–METER FINAL AT THE SUMMER OLYMPICS IN SEOUL, SOUTH KOREA (JOHNSON WOULD INFAMOUSLY BE STRIPPED OF HIS GOLD MEDAL AFTER TESTING POSITIVE FOR AN ANABOLIC STEROID). 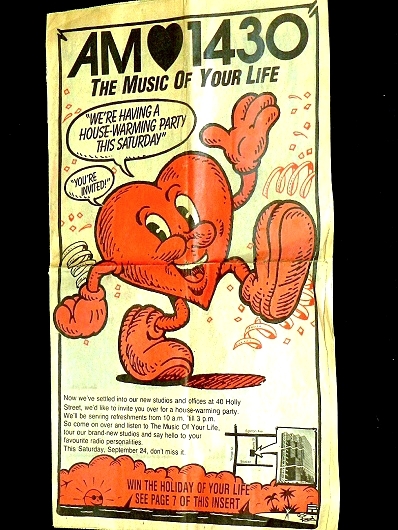 THE WALKING HEART WAS THE LOGO FOR OUR MUSIC OF YOUR LIFE FORMAT. 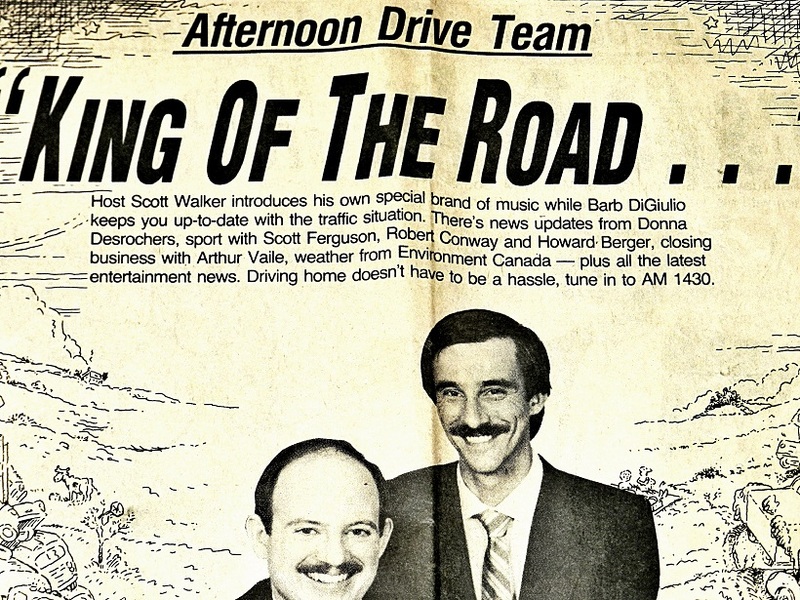 AFTERNOON–DRIVE HOST SCOTT WALKER (LEFT) AND SPORTSCASTER SCOTT FERGUSON. 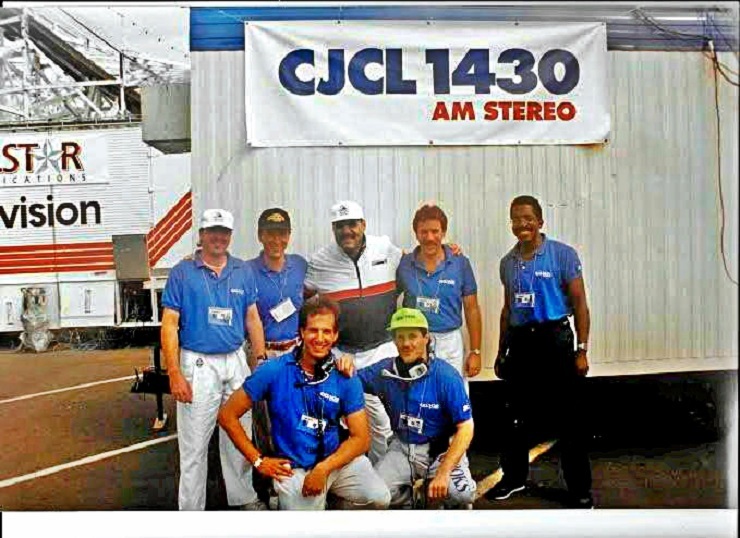 MORE OF MY EARLY RADIO COLLEAGUES AT CJCL AM–1430. WE WERE A FAIRLY TIGHT GROUP. THAT’S ME (LEFT) DURING THE SEP. 24, 1988 CJCL OPEN HOUSE. 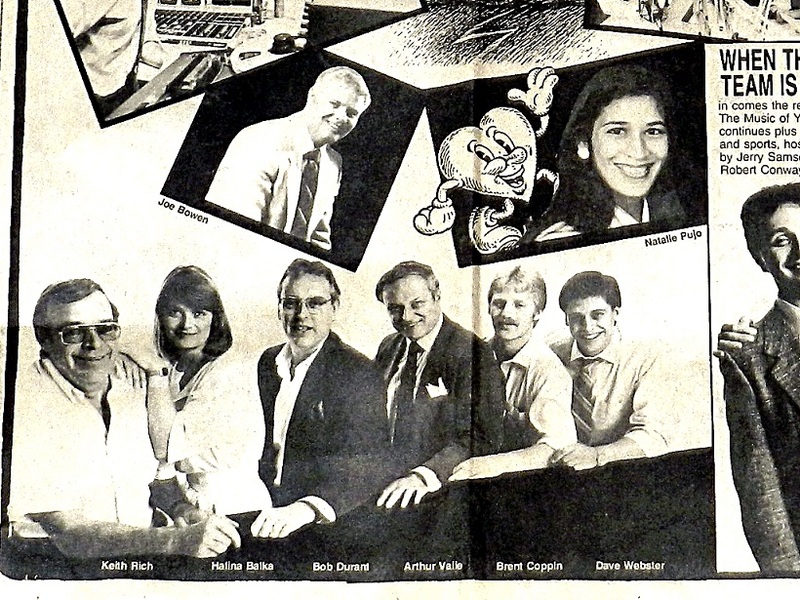 I WAS THEN AMID ILLUSTRIOUS COMPANY ON THE FIRST NEWSPAPER AD FOR PRIME TIME SPORTS (OCTOBER 1989). 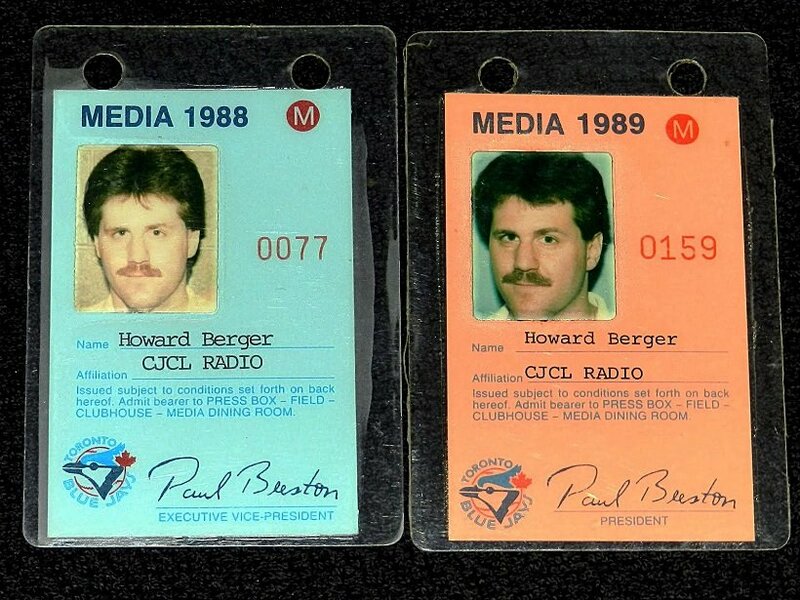 MY FIRST TWO BLUE JAYS MEDIA CREDENTIALS WHILE WORKING AT THE RADIO STATION. 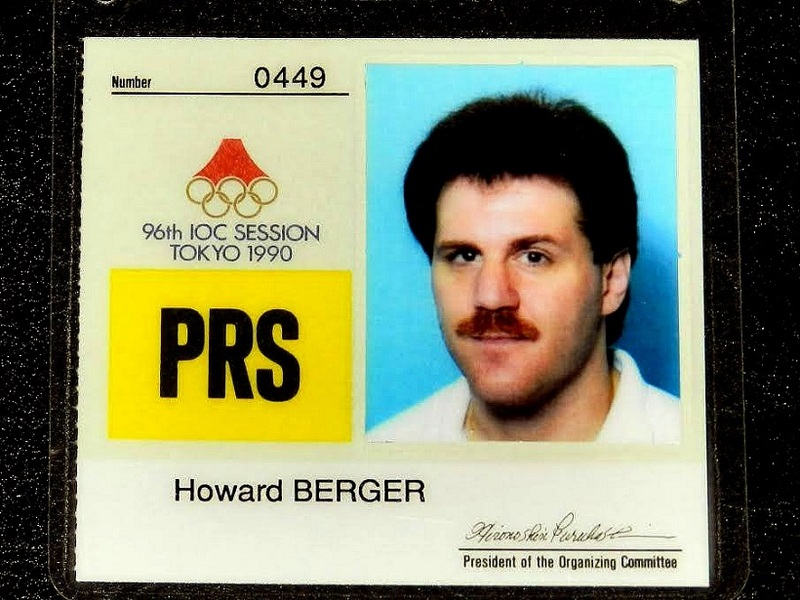 MY FIRST MAJOR ASSIGNMENT WAS THE INTERNATIONAL OLYMPIC COMMITTEE SESSION IN TOKYO (Sep. 13–18, 1990), DURING WHICH ATLANTA WAS CHOSEN OVER TORONTO TO HOST THE 1996 SUMMER GAMES. ON THE WAY HOME, I STOPPED IN LOS ANGELES AND VISITED THE WOMAN THAT WOULD BECOME MY WIFE OF 22 YEARS (AND THE MOTHER OF OUR CHILDREN, SHANE AND LAUREN). 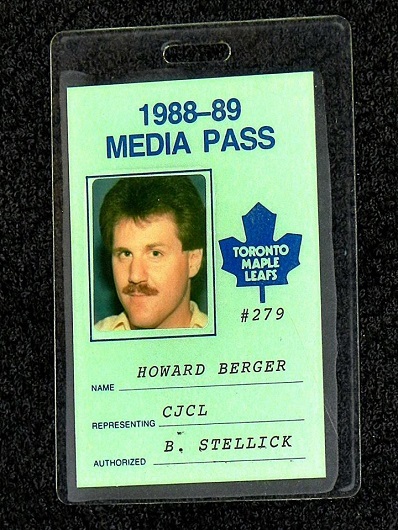 THE FIRST MAPLE LEAFS CREDENTIAL ISSUED TO ME (LEFT) WITH CJCL. I MADE THE COVER OF THE TORONTO SUN ON MAR. 23, 1991 WHILE TRYING TO INTERVIEW FORMERLY–HEATED RIVALS JOHN FERGUSON (MONTREAL) AND EDDIE SHACK (TORONTO) PRIOR TO A CANADIENS–LEAFS OLDTIMERS GAME AT MAPLE LEAF GARDENS. FERGY, A WONDERFUL MAN, DIED OF CANCER IN JULY 2007. OL’ SHACKIE, A LEAFS ICON IN THE 60’s, IS STILL STIRRING IT UP AT 80 YEARS OF AGE. 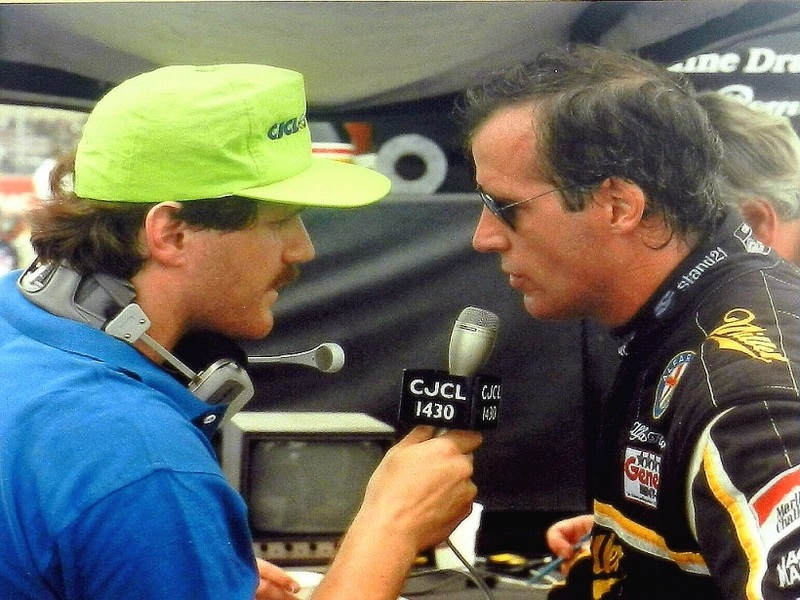 INTERVIEWING RACE–DRIVER DANNY SULLIVAN AFTER WORKING THE PITS FOR OUR INAUGURAL LIVE BROADCAST OF THE MOLSON INDY AT THE CNE, JULY 21, 1991. OUR DEDICATED CREW POSED AFTERWARD (BELOW). STANDING, LEFT–TO–RIGHT, WERE CHRIS CLARKE, ALLAN DAVIS, CHRIS MAYBERRY, NELSON MILLMAN AND GREG LOWE. I WAS LEANING ON DAN SHULMAN. YOUNG HOWARD, 33, DAYS AFTER WE SWITCHED TO THE ALL–SPORTS FORMAT. THERE WAS MUCH EXHILARATION DURING THE INFANT MONTHS OF THE FAN–1430 AS THE BLUE JAYS FINALLY WON THE AMERICAN LEAGUE CHAMPIONSHIP SERIES IN THEIR FOURTH ATTEMPT (DEFEATING OAKLAND) AND WENT ON TO BEAT ATLANTA IN THE WORLD SERIES, BECOMING THE FIRST BASEBALL TITLIST FROM NORTH OF THE BORDER. 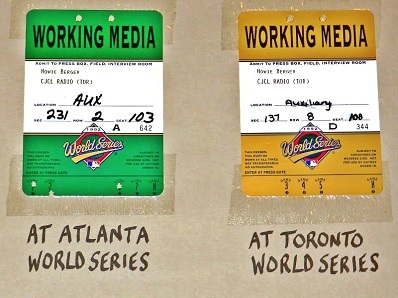 MY CREDENTIALS (TOP–RIGHT) FOR THE 1992 WORLD SERIES AT FULTON–COUNTY STADIUM AND SKYDOME. 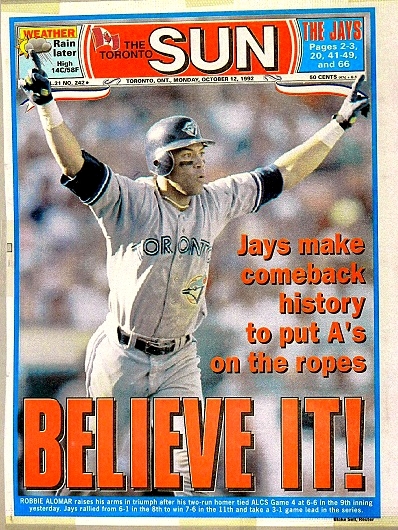 I WAS AT FIELD LEVEL NEXT TO THE BLUE JAYS DUGOUT IN THE OAKLAND COLISEUM (BOTTOM–LEFT) WHEN ROBBIE ALOMAR SMACKED HIS LEGENDARY HOME RUN OFF DENNIS ECKERSLEY OF THE A’s. 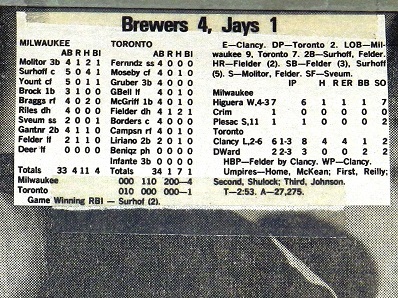 I THEN STOOD BEHIND TOM CHEEK AND JERRY HOWARTH IN THE VISITORS’ BROADCAST BOOTH AT FULTON–COUNTY STADIUM, 12 NIGHTS LATER, WHEN THE BLUE JAYS BEAT THE BRAVES TO WIN IT ALL. UNFORGETTABLE MOMENTS. LIFETIME MEMORIES. A MEMO FROM THE BOSSES THAT I’VE TREASURED TO THIS DAY. POSING WITH THE LATE, GREAT TOM CHEEK ON THE BACK COVER OF HIS AUTOBIOGRAPHY, ON WHICH WE COLLABORATED DURING THE WINTER MONTHS OF 1992–93. 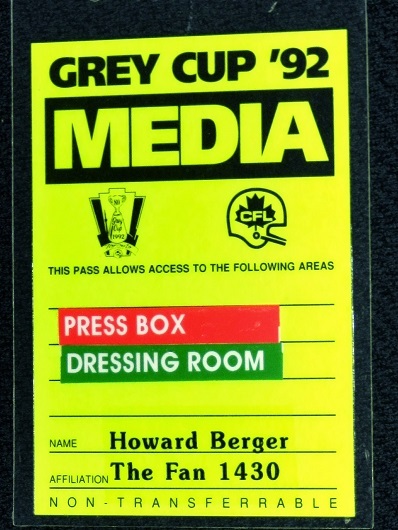 JIM (SHAKY) HUNT AND I WENT TO FROZEN WINNIPEG TO COVER THE 1991 GREY CUP (THE LAST BEFORE OUR SWITCH TO ALL–SPORTS). THE ARGONAUTS, AND ROCKET ISMAIL, DEFEATED THE CALGARY STAMPEDERS. THE FIRST GREY CUP IN OUR SPORTS FORMAT YEARS WAS 1992 AT SKYDOME (TOP–RIGHT), WHEN DOUG FLUTIE AND THE STAMPEDERS UPENDED WINNIPEG. COVERING AN AFTERNOON GAME (TOP–LEFT) AT THE COW PALACE IN SAN FRANCISCO DURING THE SAN JOSE SHARKS FIRST NHL SEASON (THEY UPSET THE LEAFS, 4–1). THE FIRST NHL DRAFT OF OUR SPORTS FORMAT YEARS (TOP–RIGHT) — AT THE MONTREAL FORUM. ROMAN HAMRLIK WAS THE INITIAL PICK, BY TAMPA BAY. ERIC LINDROS WAS TRADED FROM QUEBEC TO THE NEW YORK RANGERS AND PHILADELPHIA (OR SO EACH TEAM CLAIMED). AN ARBITRATOR AWARDED HIM TO THE FLYERS. 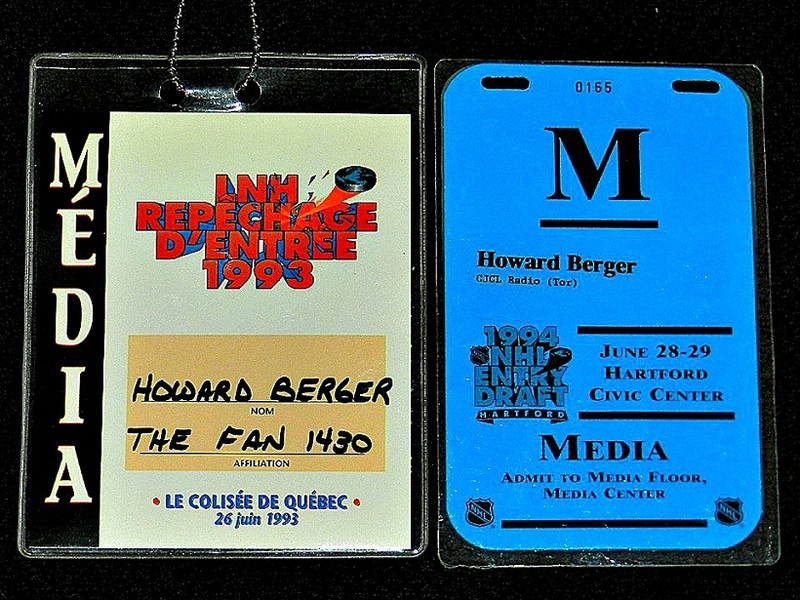 THE 1993 NHL DRAFT (TOP–LEFT) AT THE COLISEE IN QUEBEC CITY, FEATURING ONE OF THE GREAT BLUNDERS OF ALL TIME: OTTAWA CHOOSING ALAIN DAIGLE AHEAD OF CHRIS PRONGER. 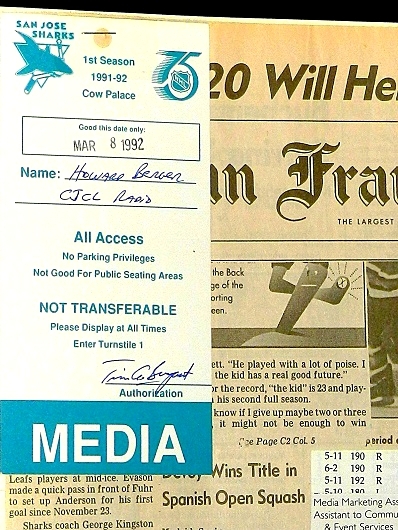 AND, MY BEST PERSONAL MOMENT OCCURRED JUST PRIOR TO THE 1994 DRAFT AT THE HARTFORD CIVIC CENTER (TOP–RIGHT) WHEN A PLAYER AGENT HANDED ME A SHEET OF PAPER WITH ALL THE PARTICULARS OF THE YET–TO–BE–ANNOUNCED TRADE THAT BROUGHT MATS SUNDIN TO THE LEAFS FROM QUEBEC. I WAS LIVE ON THE AIR WITH DAN SHULMAN AND JIM HUNT AT THE TIME. THE AGENT SAID “GO WITH THIS! !” I DIED A THOUSAND DEATHS WHILE READING THE NAMES TO DAN AND SHAKY, ONLY TO BREATHE AGAIN AFTER GARY BETTMAN ANNOUNCED THE EXACT DEAL TO THE CROWD. WHEW! I COVERED THE 1992 MAJOR LEAGUE BASEBALL ALL–STAR GAME AT JACK MURPHY (NOW QUALCOMM) STADIUM IN SAN DIEGO (TOP–LEFT), LESS THAN TWO MONTHS BEFORE WE SWITCHED TO ALL SPORTS. 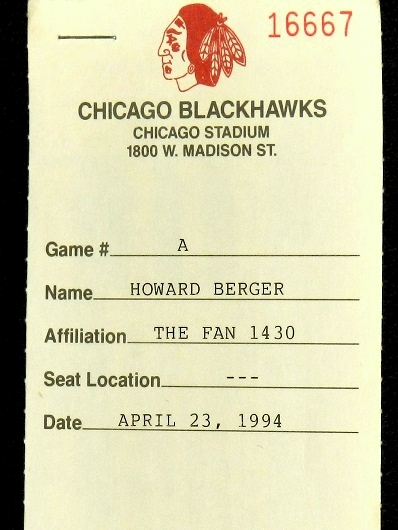 AND, WE WERE STILL THE FAN–1430 DURING ROUND 1 OF THE STANLEY CUP PLAYOFFS IN 1994, AS THE LEAFS PLAYED THE BLACKHAWKS. 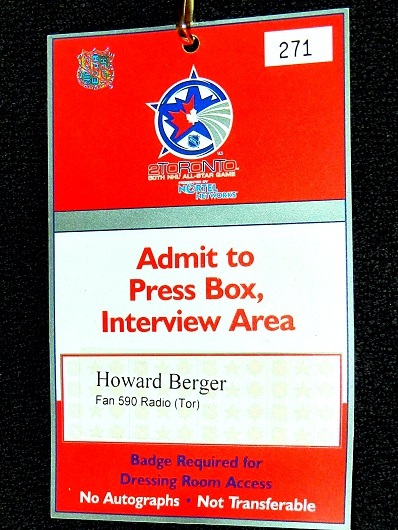 THIS CREDENTIAL (TOP–RIGHT) FROM GAME 3 AT OLD CHICAGO STADIUM. MY HAND APPEARED IN A SPORTS ILLUSTRATED PHOTO (BELOW) WHILE INTERVIEWING NIK BORSCHEVSKY OF THE LEAFS AT JOE LOUIS ARENA, MOMENTS AFTER HIS OVERTIME GOAL IN GAME 7 ELIMINATED DETROIT FROM THE OPENING ROUND OF THE 1993 PLAYOFFS. THIS MICROPHONE–FLASH INCURRED A NUMBER OF SCARS WHILE IT ACCOMPANIED ME ON COUNTLESS ROAD TRIPS WITH THE MAPLE LEAFS FROM 1996 TO 1998. IT’S A TERRIFIC MEMENTO. AGAIN AMID ILLUSTRIOUS COMPANY ON MAGAZINE ADS IN 1995 (LEFT) AND 1998. WAYNE GRETZKY’S FINAL NHL GAME (TOP–LEFT) AT MADISON SQUARE GARDEN IN NEW YORK. HARD TO BELIEVE IT WAS MORE THAN 18 YEARS AGO. 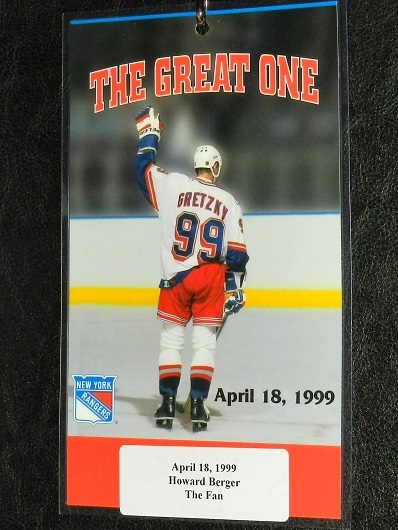 AND THE 2000 NHL ALL–STAR GAME — THE ONLY ONE TO BE HELD, THUS FAR, AT THE AIR CANADA CENTRE. 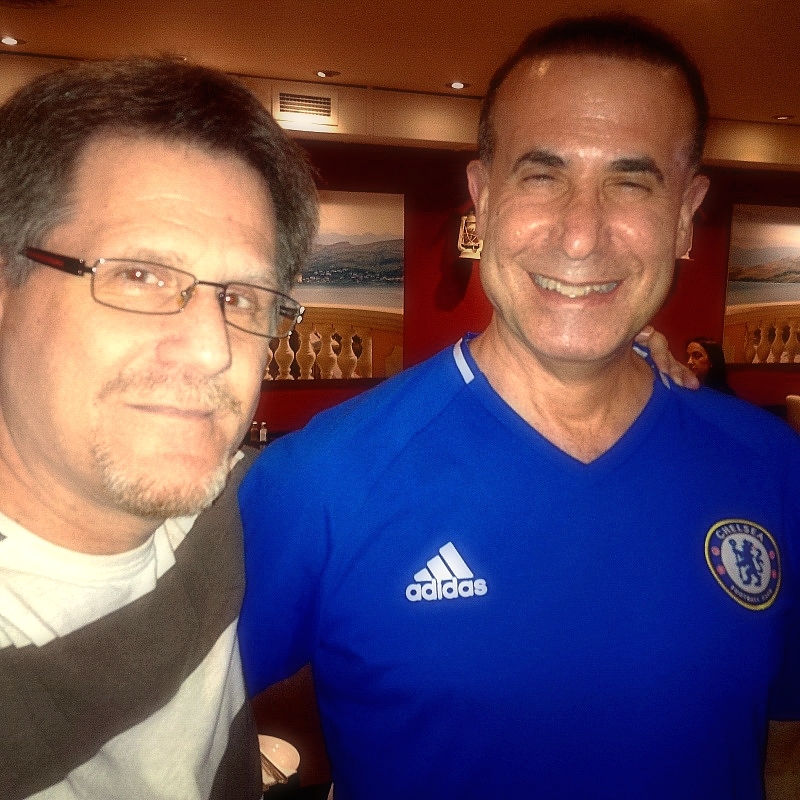 WITH MY FRIEND, BARB DIGIULIO (TOP–LEFT). WE WORKED TOGETHER DURING MY ENTIRE TERM AT THE RADIO STATION, SAVE FOR A BRIEF PERIOD, IN 1989, WHEN BARB MOVED TO FLORIDA. 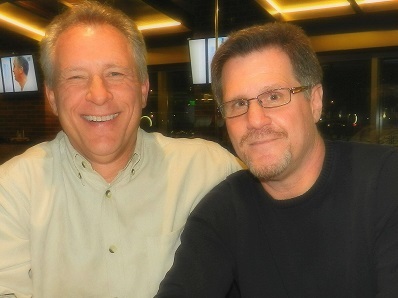 ALLAN DAVIS (TOP–RIGHT) IS THE MAN WHO CAN BE CREDITED, OR BLAMED, FOR MY RADIO CAREER. HE WAS INSTRUMENTAL IN HIRING ME AT CJCL IN MAY 1988. UNCLE AL NOW RUNS THE ALL–SPORTS STATION IN BUFFALO, N.Y. — WGR–550. 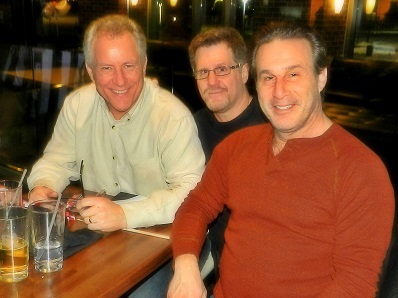 WITH ALLAN DAVIS AND KEN DANIELS, IN BUFFALO (JAN. 12, 2015). THEN WITH BARB AND KEN HERE IN TOWN ON MAR. 7 OF THIS YEAR. DETROIT PLAYED THE LEAFS THAT NIGHT AT THE ACC. STANDING OUTSIDE BMO FIELD AFTER AN ARGOS–B.C. GAME (AUG. 31, 2016) WITH EX–COLLEAGUE DON LANDRY, WHO CO–HOSTED OUR MORNING SHOW ALONGSIDE GORD STELLICK. AND, HOW COULD I POSSIBLY EXCLUDE THE LATE NIGHT VAMPIRE: STORMIN’ NORMAN RUMACK? THE CURRENT RADIO STATION LOGO. What about the Fence dog in Boston? Seriously, great memories from a fun time in radio! Say hello to Barb next time you see her. Always enjoy these blogs Howard–keep them coming!